ONCE UPON A TIME there was an Upper Pyne and a Lower Pyne, Tudor twins from 1896 gracing either side of the Nassau-and-Witherspoon heart of Princeton. Upper Pyne was razed in 1963. Lower Pyne, thankfully, still stands. 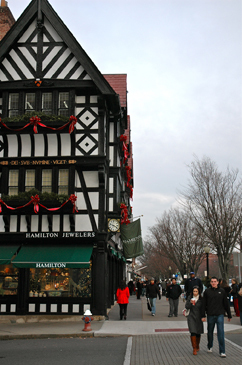 Intended to provide space for shops at the street level, dormitory rooms for undergraduates in the stories above, the buildings were designed by architect Raleigh C. Gildersleeve on the model of 16th-century houses in Chester, England. The Regional Planning Board of Princeton expressed its unanimous support for the Dinky at its meeting last Thursday night, voting in favor of continued and improved rail service between Princeton and Princeton Junction. A recent meeting of the Circulation Committee of the Princeton Regional Planning Board dealt in part with turning lane closures along Route One that have been proposed by the state. Borough Council considered local traffic concerns at their meeting last week as members of the Traffic and Transportation Committee as well as the Princeton Joint Pedestrian and Bicycle Advisory Committee detailed their recommendations for municipal approval. The mayors of both municipalities were present at the Princeton Public Library Board of Trustees meeting last week to hear President Katherine McGavern thank them for their support over the past year. Along with other board members, Borough Mayor Mildred Trotman and Township Mayor Bernie Miller also received copies of Library Director Leslie Burgers annual report to Borough Administrator Bob Bruschi and Township Administrator Jim Pascale describing the years accomplishments and goals for 2011. Introducing him as “the original Stanley Fish” at last week’s Lewis Library event, Law and Public Affairs Program Director Kim Lane Scheppele acknowledged the guest speaker’s lengthy list of titles, many accomplishments (he is a Milton scholar), and reputation as a provocateur (among his essays is one on the Randy Newman song, “Short People”). As if that wasn’t enough, he is currently a regular contributor to the New York Times’s “Opinionator” blog. Over the past few years, the Princeton High boys basketball team has utilized its athleticism and an up-tempo style to become a force in local hoops circles. It was fitting that for its winter concert, the Princeton University Orchestra chose music of a 20th century Russian composer torn between two careers featuring another 20th century Russian native also equally at home in two performing careers. For the orchestra’s performance on Friday night (the concert was repeated Saturday night) conductor Michael Pratt chose a concerto and symphony of Dmitri Shostakovich, who divided his early career between that of pianist and composer. Joining the orchestra for this set of performances in Richardson Auditorium was Ignat Solzhenitsyn, who has maintained a dual career between the piano and the podium. Mr. Solzhenitsyn was the featured soloist in Shostakovich’s Piano Concerto No.1 in c minor and led the ensemble in Shostakovich’s Symphony No.8, also in c minor. The concerto seemed second nature to Mr. Solzhenitsyn and he proved equally at home in the monumental symphony. No holiday gift is more welcome and valued than a lovely piece of jewelry. It will last and be a continual remembrance of the sentiments of the gift-giver.